I’ve really enjoyed the mellow Indian Summer we have had here in Colorado this year. But with these crisp mornings and pumpkins cropping up everywhere, I think it’s officially fall. And with the changing of the leaves I automatically feel my “nesting urge” coming on. I love bringing out my cozy throws and setting up a fire for the first time. And, of course, I start to look over my house and decide what seasonal updates I’m going to make this year. 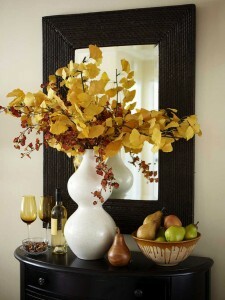 I like my home to reflect the change of seasons with smaller items that can easily be added or swapped out. Although I love the bright yellow, oranges and red leaves outside, I’m not an overall fan of bright orange, or the corn husk/hay bales/pumpkin decor that I see everyone doing over and over this time of year. I like to bring fall into my home with rich chocolate brown, pale yellows of butternut squash, wheat & sage greens. Maybe a little splash of deep red. 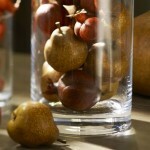 For example, I like vases filled with big yellow sunflowers, berry stems, or red maple branches. Fall is a great time to integrate natural, rustic elements like wooden trays, gourds, wide bowls of mini cream-colored pumpkins, red apples, and golden pears. And don’t forget bowls of nuts and scattered fall leaves for your table settings. Scented candles ( pumpkin, apple pie, cinnamon, butter scotch & vanilla to name a few!) complete the experience. So, bring the fall indoors…it is simple and sophisticated with very little cost.